I've always had an obsession with public space and maps. Any new place I visit, my first instinct is to find and inventory my closest public parks. 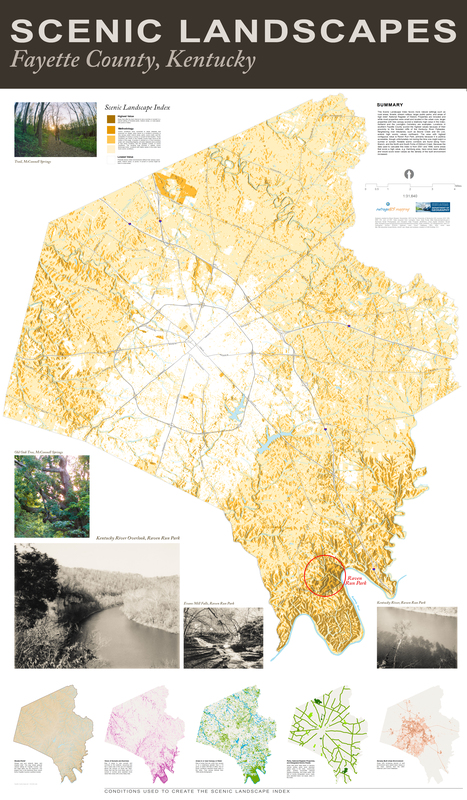 My published cartography focuses on favorite parks and wilderness areas. In researching parks, my interests range from GPS mapping topographic features to video documentaries exploring historic city spaces. I've studied the development of large parks and forests in the historical context of economic exploitation of natural resources and changing ideas of scenic beauty and recreation. I've studied the genesis of urban park systems when Progressive Era ideas sculpted new programs for creative self-expression in city parks. From graduate student research, I made an hour-long documentary exploring Kentucky's once-segregated black parks. Because of Jim Crow laws in the 1940s, Kentucky had cities with white-only and black-only park systems and even a black-only state resort park on Kentucky Lake. These parks remain a popular destination and space for annual cultural events. The KET-funded documentary can viewed here: At Leisure's Edge. My current research focuses on one's experience in parks, especially while navigating. I want to map and evaluate trail difficulty through terrain modeling and use overlay analysis to derive a scenic landscape index. Being in the park, though, is the goal. In our digital lives, public parks, whether in remote backcountry or leafy city parks, offer a discovery of an untethered self with only primitive technology (until a cell tower is built nearby). I teach courses in physical geography, cartography, and GIS. 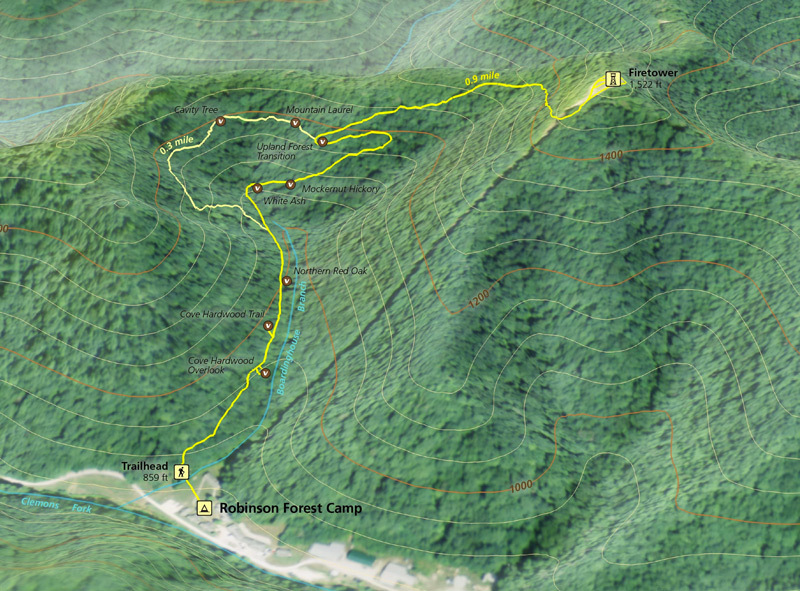 I've been hard at work finishing a trail map for the Cumberland Gap National Historical Park and surrounding area. 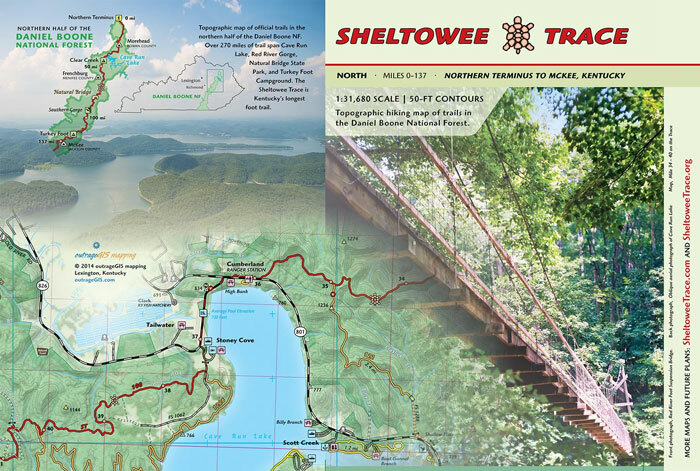 This project is an update of outrageGIS mapping first Gap trail map. The map is printed on a larger sheet size (39" x 13.35" divided into two sheets for convenient use) and at a scale of one-inch to a half-mile. Please explore the drafts via links below and let me know if you have any suggestions. The students compiled their maps, geotagged photos, and stories in a nicely designed website (https://reece2ke.github.io/geo409_site). We focused on 3D mapping in the last part of the semester. The maps and animations can be found on this website (http://boydx.github.io/tbt). 3D views and animations of Pilot Knob State Nature Preserve. During the 2016 spring semester, GEO 409 undergraduate GIS class analyzed and mapped collisions of cars with pedestrians and bicyclists. We focused on 12 years of data (1/2/2004 - 4/8/2016) for Fayette County, Kentucky, which contains the city of Lexington and a population of over 300,000. The county is home to Kentucky's largest university (us!) and offers a walkable and bikeable campus with connections to a vibrant downtown. Explore these maps to find demographic information of cyclists involved in collisions with automobiles. In Geo 409, we developed tools to process spatial data for any area of interest and feed other visualization platforms, like QGIS 3d mapping and CartoDB. This lab had an utility outside of class. A guidebook publishing company, Wolverine Publishing, needed maps for a popular climbing area in Idaho, City of Rocks. Find the Github repo and sample maps here. 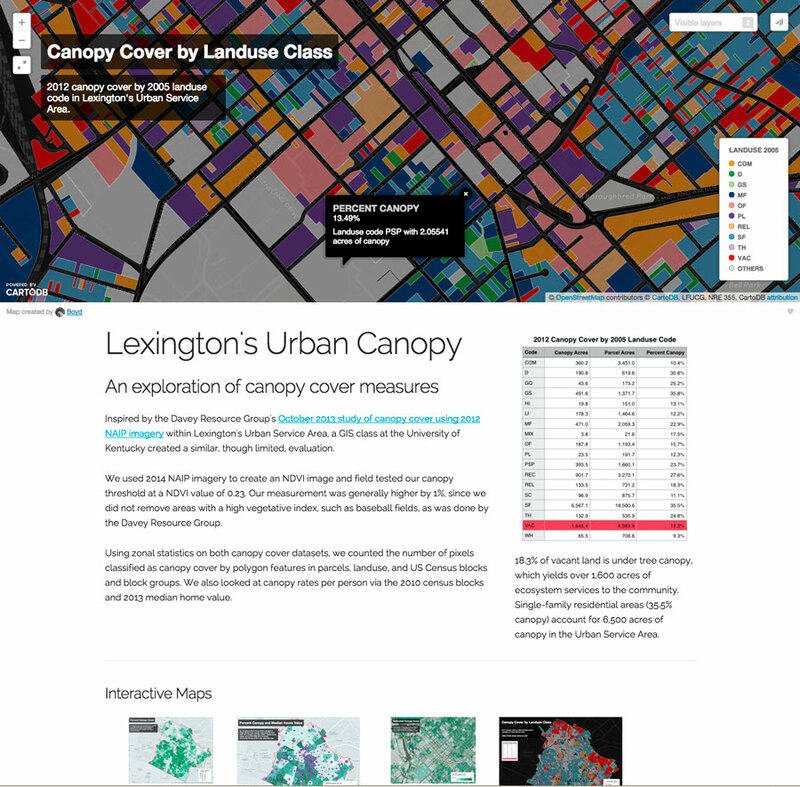 Inspired by the Davey Resource Group's October 2013 study of canopy cover using 2012 NAIP imagery within Lexington's Urban Service Area, a GIS class at the University of Kentucky created a similar, though limited, evaluation. We used 2014 NAIP imagery to create an NDVI image and field tested our canopy threshold at a NDVI value of 0.23. Our measurement was generally higher by 1%, since we did not remove areas with a high vegetative index, such as baseball fields, as was done by the Davey Resource Group. Using zonal statistics on both canopy cover datasets, we counted the number of pixels classified as canopy cover by polygon features in parcels, landuse, and US Census blocks and block groups. We also looked at canopy rates per person via the 2010 census blocks and 2013 median home value. 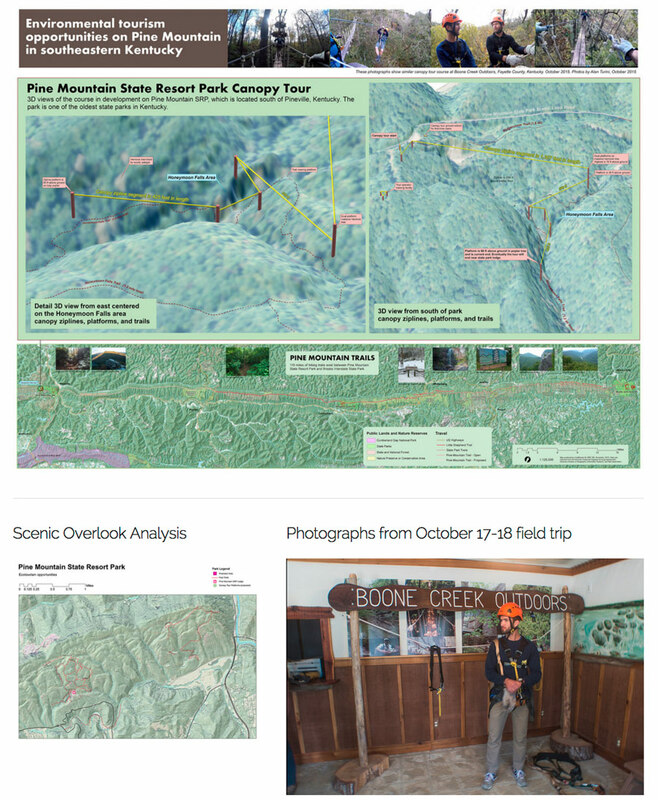 In October 2015 an undergraduate GIS class at the University of Kentucky endeavored to map and analyze environmental tourism assets on Pine Mountain. During discussions with Pine Mountain State Resort Park, we discovered a canopy zipline tour, one of the first in the state, was being installed in the park. 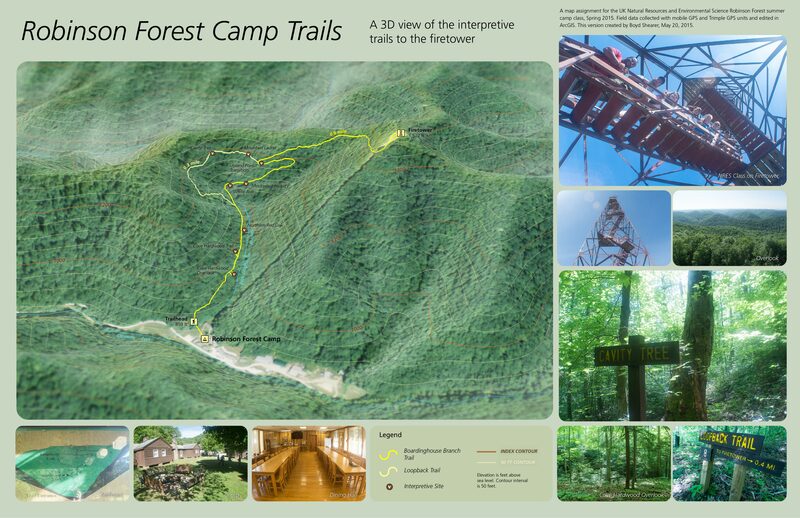 We contacted the developer, Burgess Carey, and asked if we could map the canopy zipline course. We participated in a canopy tour at Boone Creek Outdoors to better understand this unique mapping challenge. We subsequently went to Pine Mountain and GPS located the canopy platforms and measured their heights. 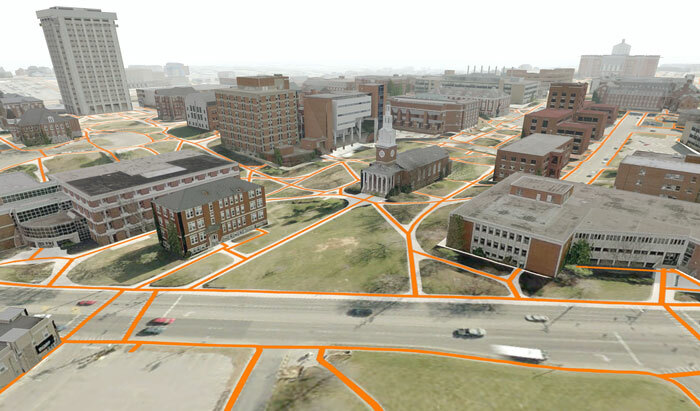 In the lab we made 3D views with ESRI's ArcScene and mapped nearby recreational assets using ArcMap. As part of UK Natural Resources and Environmental Sciences 2015 Summer Camp, I taught a one-day GPS and GIS exercise to map the interpretive trails around base camp. With seven undergraduates and their mobile devices and one Trimble ProXRS, we split into three teams. 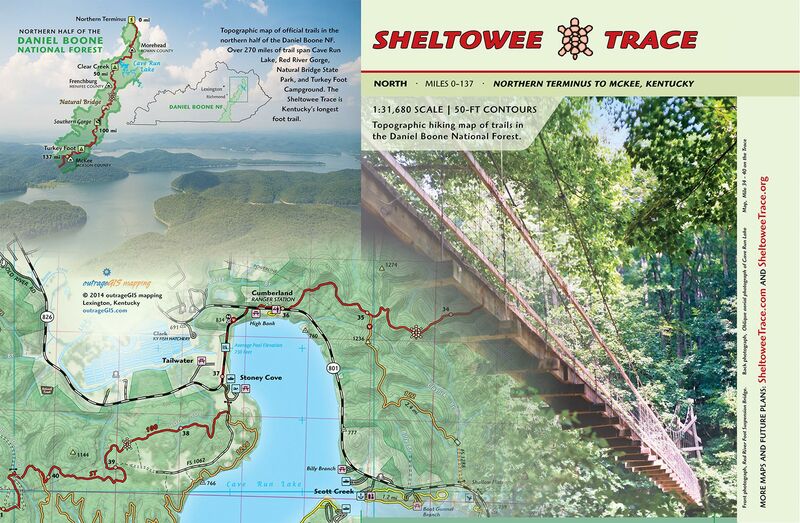 One team focused on the trail network and GPS mapped trail alignment and intersections. 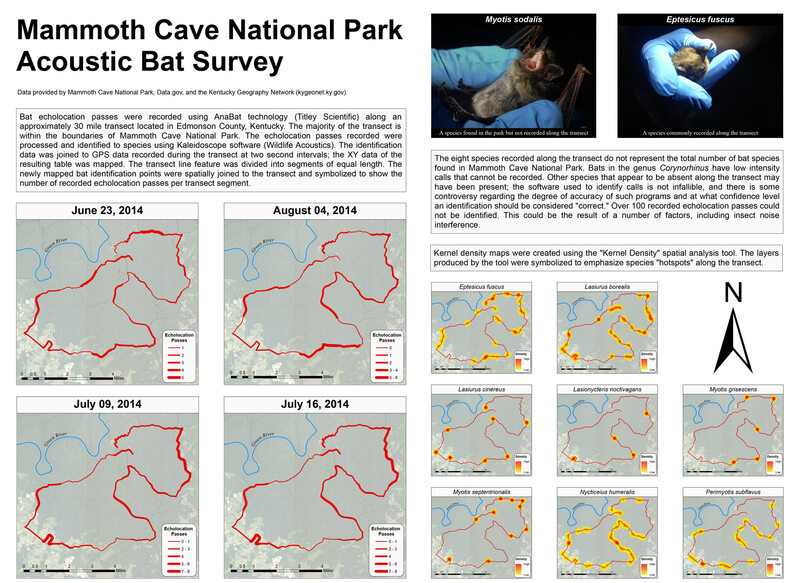 A second team mapped interpretive sites on the left-side of trials, while a third-team mapped right-side features. In the second-half of the day, we worked in the classroom and on laptops to make a map in ArcGIS. Some students had GIS software experience and helped their fellow classmates to make a map as a geospatial PDF and use on their mobile devices. A GeoPDF is a mobile map that doesn't require a cellular data connection to function. During two weekends this spring, students in UK GEO 309 (Intro to GIS) were asked to log celebrations associated with UK men’s basketball NCAA tournament around campus in selected zones. Student teams were then tasked to map and analyze these patterns of celebrations during the last week of class. Their maps and photographs are shown here. Their topics include: locations of campus rental properties, noise pollution from major party locations, population density, and changes in social media engagement during and after games. 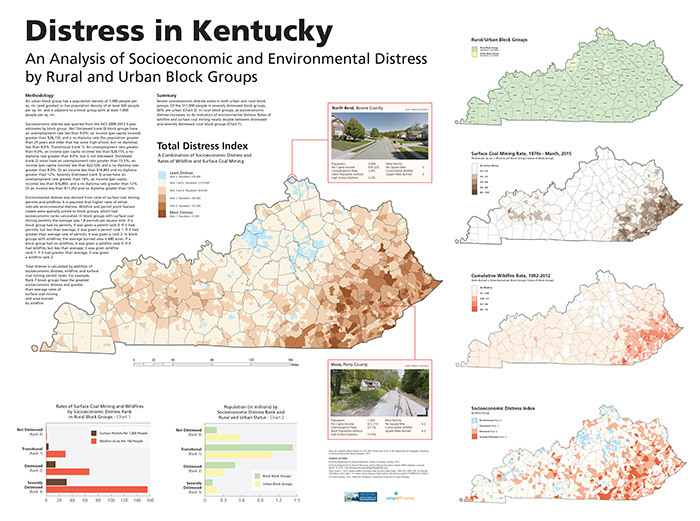 Severe socioeconomic distress exists in both urban and rural block groups in Kentucky. Of the 311,000 people in severely distressed block groups, 60% are urban. In rural block groups, as socioeconomic distress increases, so do indicators of environmental distress. Rates of wildfire and surface coal mining nearly double between distressed and severely distressed rural block groups. 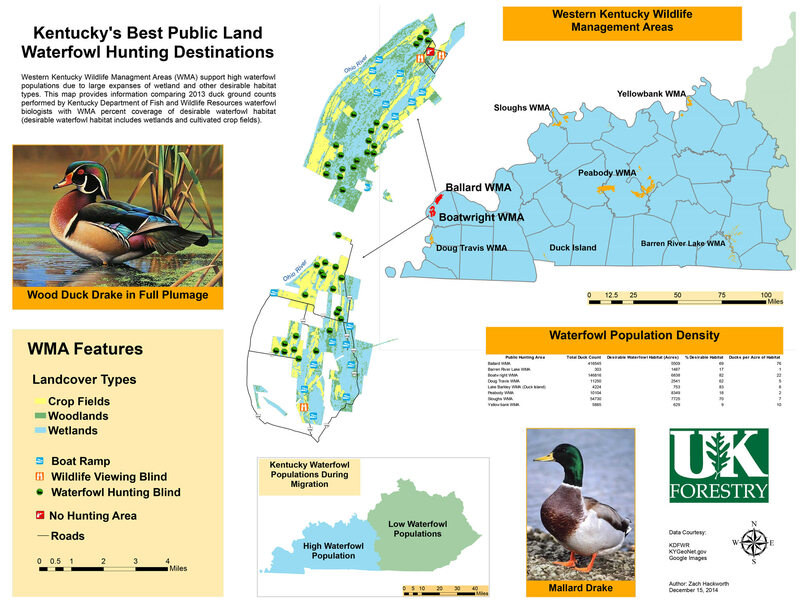 Final posters from GIS courses at the University of Kentucky College of Agriculture, Food, and Environment (FOR 330, NRE 355, and LA 355). 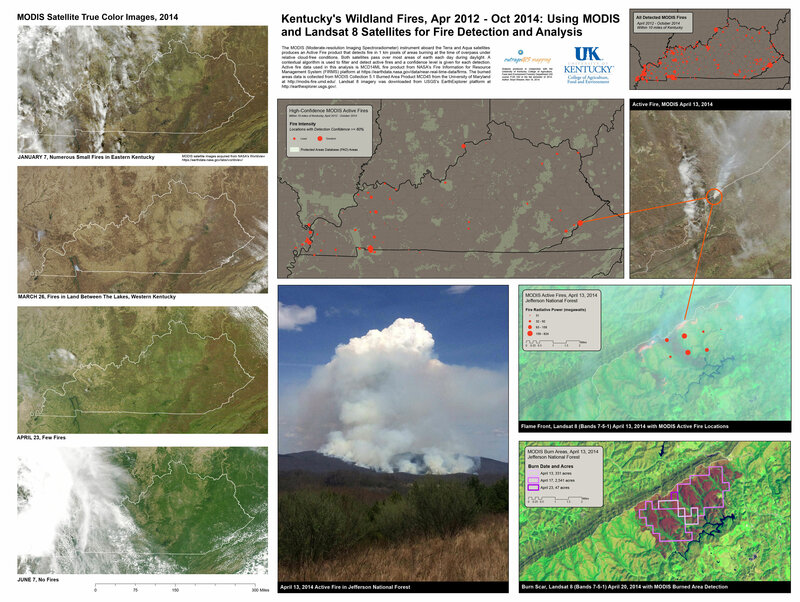 Kentucky has damaging wildland fires, while also using prescribed burns to manage habitat. 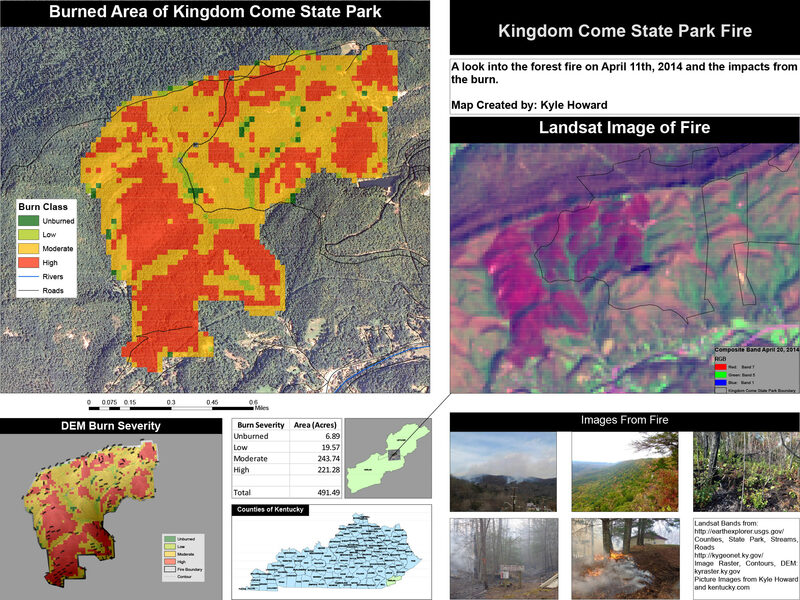 An unfortunate statistic tells us that most wildland fires in Kentucky are from arson. This lab uses MODIS Active Fire Detection products and Landsat 8 near-infrared bands to locate and analyze the largest fires between April 2012 and October 2014. 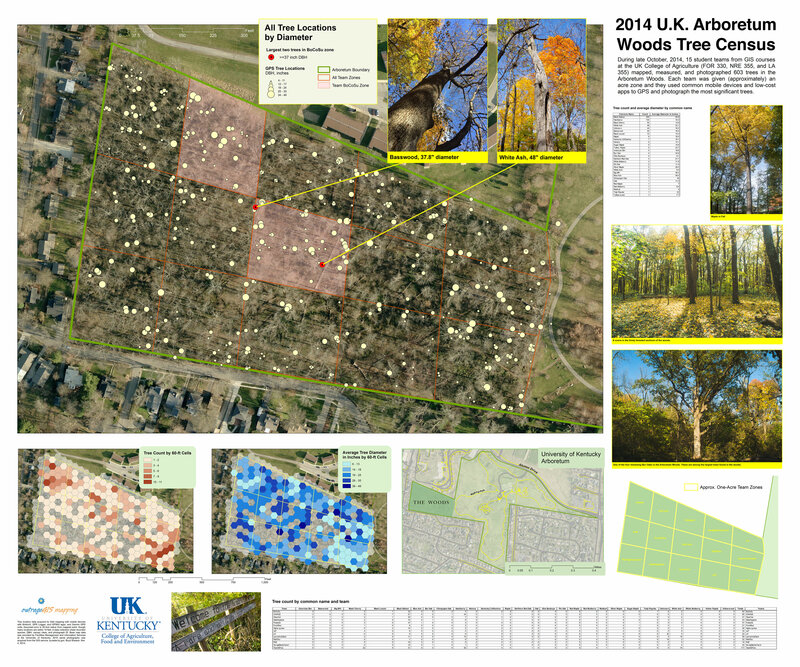 15 student teams from two GIS courses mapped, measured, and photographed 603 trees in the Arboretum Woods. Each team was given (approximately) an acre zone and they used common mobile devices and low-cost apps to GPS and photograph the most significant trees. 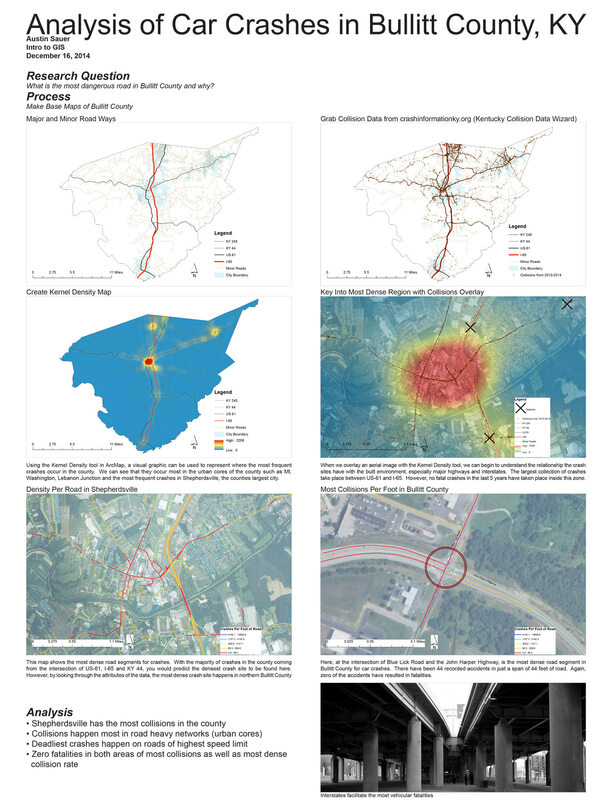 Each team made a poster and presented them during a 2014 International GIS Day event. Since students photographed each tree, we made an interactive map that shows these photos and can be used for geolocation while in the woods. Look at trees now! Modeling campus in ArcGlobe using the LiDAR elevation data and UK’s Facilities Information Services latest datasets. A Pedshed is used to show how many people are connected by pedestrian paths and sidewalks with either a five-minute or fifteen-minute walk. Only roads with sidewalks are included in the analysis. It is assumed that people can walk faster on pedestrian paths (3.4 mph) than roads with sidewalks (2.8 mph). That's fast! For more casual walking, speeds are about half as fast. Paved paths and sidewalks were attributed and digitized from 2010 aerial photography by students in University of Kentucky Department of Geography's GEO 409 course, Spring 2014. This analysis has a focus on existing access and potential future access (of various completed designs) of Lexington's two longest shared-use trails, the Legacy and Town Branch Trails. Fayette & Jefferson Counties, February, 2014. 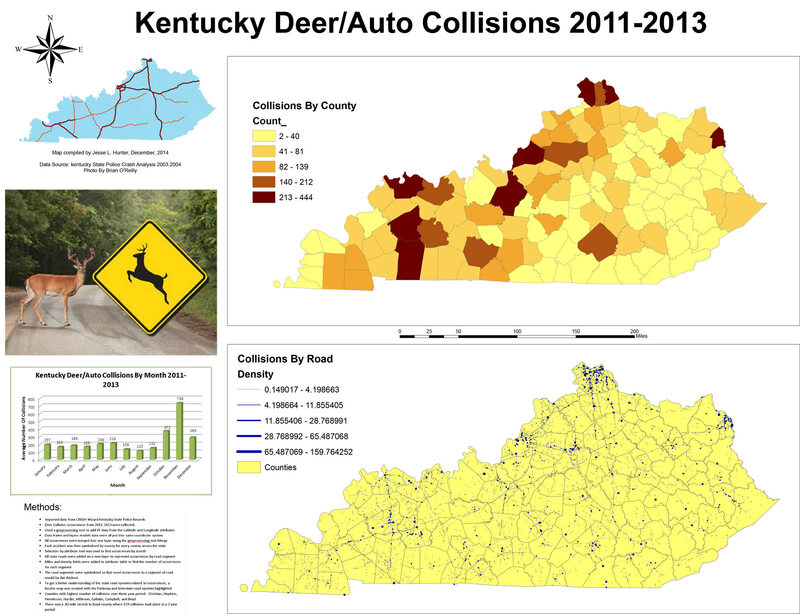 Point locations for collisions were downloaded from the Kentucky Collision Analysis for the Public (http://crashinformationky.org/) hosted by the Kentucky State Police. 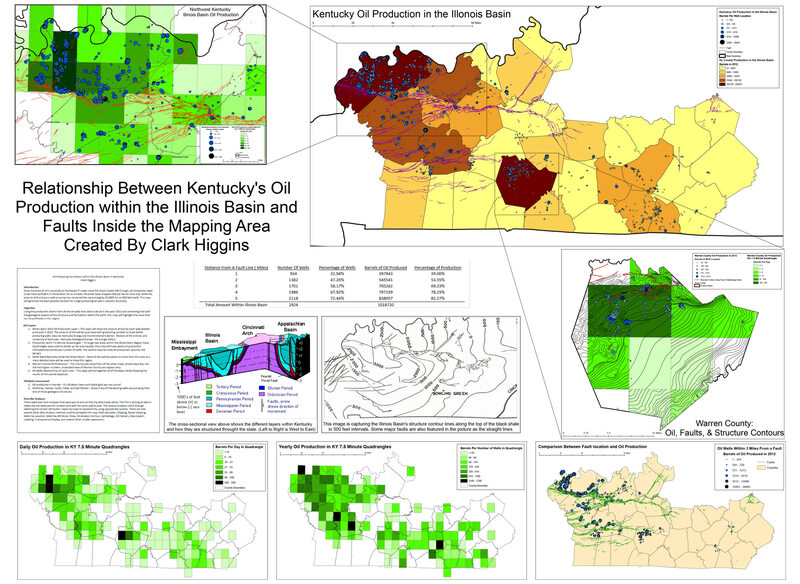 Analysis was performed for Kentucky's Fayette and Jefferson Counties for data period January 5, 2003 - February 23, 2014 as part of GEO 409, Spring 2014. An ArcGIS ModelBuilder and Python script was created to automate geoprocessing of data and map generation. AMONG ALL COLLISIONS 4,592 pedestrians v. car collisions occurred with 173 pedestrian fatalities (3.8% of total) and 4223 pedestrian injuries (92% of total). AMONG ALL COLLISIONS WITH PEDESTRIANS USING ALCOHOL OR DRUGS 257 pedestrians v. car collisions occurred with 26 pedestrian fatalities (10%) and 227 pedestrian injuries (88% of total). AMONG ALL COLLISIONS 1,689 pedestrians v. car collisions occurred with 47 pedestrian fatalities (2.9% of total) and 1580 pedestrian injuries (94% of total). AMONG ALL COLLISIONS WITH PEDESTRIANS USING ALCOHOL OR DRUGS 130 pedestrians v. car collisions occurred with 9 pedestrian fatalities (6.9%) and 118 pedestrian injuries (91%). Summary: This Scenic Landscape Index favors more natural settings such as rural areas, forests, stream valleys, larger public parks, and areas of high relief. National Register of Historic Properties are included and while most properties were small and located in the urban core, larger properties with tree canopy scored a relatively high value in the index; Ashland and the Lexington Cemetery are examples. Locations in southern Fayette County scored the highest values because of their proximity to the forested cliffs of the Kentucky River Palisades. Neighboring river tributaries, such as Boone Creek and Elk Lick, extend high scenic values northward. The area with highest contiguous value is Raven Run Park, primarily because it is publicly accessible, though unfortunately not during the time one might watch a sunrise or sunset. Notable scenic corridors are found along Town Branch, and the North and South Forks of Elkhorn Creek. Because the data used to calculate this index is from 2001 and 1998, some areas that score a high value, e.g. Hamburg area, have since been altered and would score lower values as the density of the built environment increased. Methodology: Scenic conditions were converted to raster datasets and assessed an integer value based on a location's proximity to tree canopy, water, historic areas, parks, scenic roads, and the probability of seeing a sunrise or sunset at that location. Those conditions are shown in the Fayette County maps found at the bottom of this page. A location is defined as a 5-foot resolution raster cell. Using Map Algebra, all raster datasets were overlaid to find which locations had the greatest number of scenic conditions. The resulting map provides a relative scenic landscape index. Locations with higher values in the index have more scenic conditions. For example, areas with the highest values offer the best chance to see a sunrise or sunset in a natural setting of forested parks, historic areas, or rural places with ponds or lakes. Areas with the lowest values are primarily dense urban environments without tree canopy cover, parks, historic areas, or ponds. 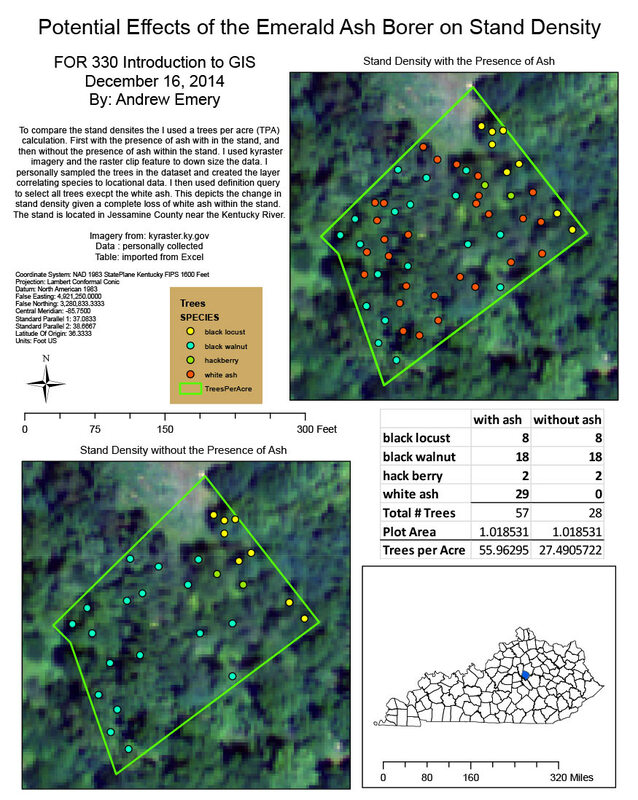 Analysis created by Boyd Shearer, November, 2013 for the University of Kentucky GIS courses GEO 309, NRE 355, and LA 855. Data acquired from Lexington Open Data Portal (link), Kentucky Aerial Photography and Elevation Data Program (KYAPED) 5-foot Digital Elevation Model (link), and U.S. Geological Survey (USGS) National Land Cover Database 2001 land cover layer (link). Maps and analysis created in ESRI ArcMap 10.1. Views of Sunsets and Sunrises is an index of areas to view sunsets and sunrises on the solstices, assuming one has a clear view of the sun at 8 degrees above the horizon on these two days. Areas that had the most likely view of a sunset or sunrise were awarded more value than areas with a less likely view. Proximity to Tree Canopy and Water is an index of areas that are under tree canopy or on a waterbody (greater than a 1/4 acre), or within 200 feet of either. Any of these conditions awarded equal value in the index. Tree canopy derived from 1998 aerial photography. Parks, National Register of Historic Properties, and Scenic Roads is an index of areas that were state parks or passive natural setting parks were awarded higher value in the index. Community parks, publicly accessible national register properties, and areas within 500 feet of county designated scenic roads were awarded lower, but equal, value in the index. Densely Built Urban Environment is an index of areas with increasing density of built environment were awarded lower values in the index. Derived from the 2001 National Land Cover Database. Lexington, Kentucky. October 15, 2008 - October 14, 2013. 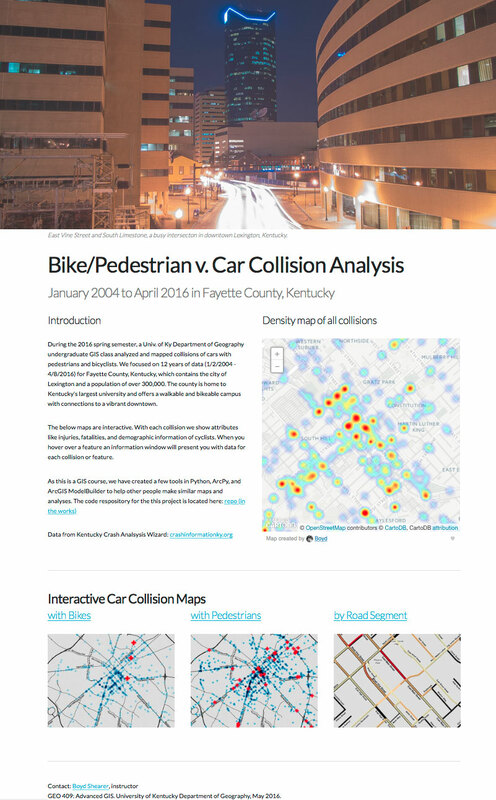 A 5-year analysis of bicycle accidents reported by Kentucky law enforcement agencies in Fayette County. Within Fayette County, 396 bicycle and motor vehicle collisions were reported with 293 injuries and 3 fatalities. The average age of the cyclist was 29 years, 76% were male, and only 25% were wearing a helmet. 21% of the collisions were hit-and-run. 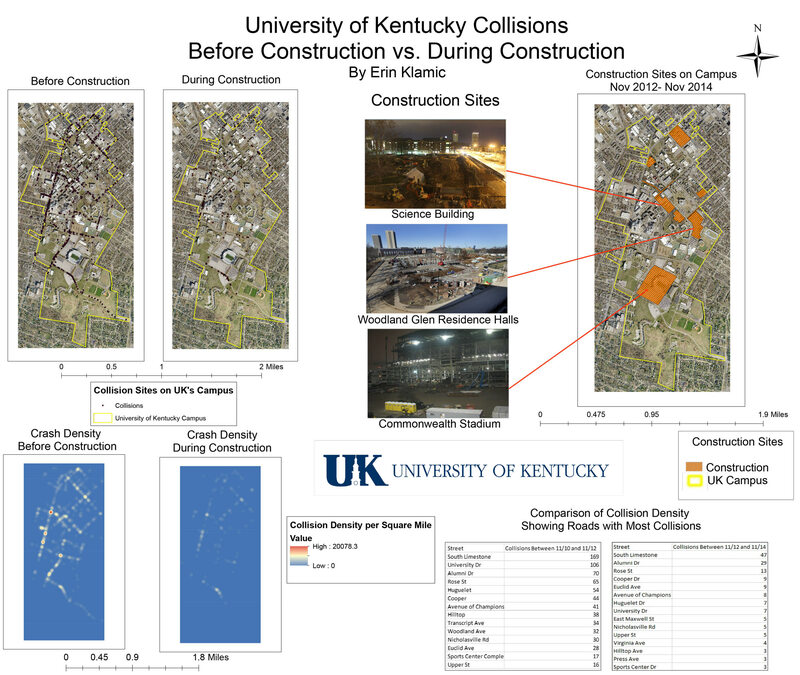 The greatest rate, or density, of crashes centers on UK's campus. The next highest density was downtown, followed by small increases in crashes near Harrodsburg and Waller Ave, Winchester Rd, and on Loudon Ave. Critical street segments in order of greatest number of crashes are: Limestone north of Virginia Ave, Euclid Ave east of Woodland Ave, Rose St between Euclid and Huguelet Dr, and Winchester Road near intersection with East Third St.
Maps and analysis by Boyd Shearer for GEO 309, NRE 355, and LA 855, October 20, 2013. University of Kentucky. 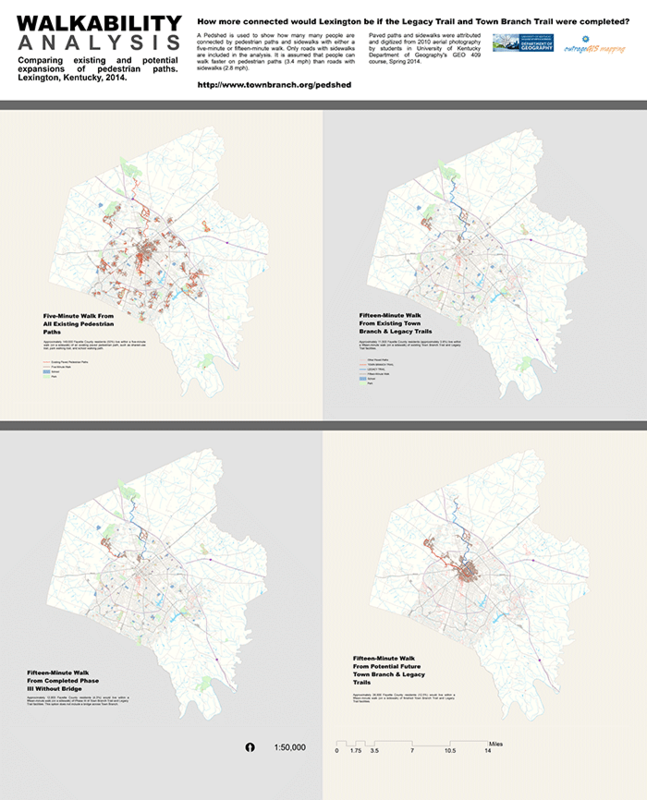 Data acquired from the Kentucky State Police's Kentucky Collision Analysis for the Public database (http://crashinformationky.org/) and the 2007-2011 American Community Survey 5-Year Estimates for Block Groups (http://www.census.gov/geo/maps-data/data/tiger-data.html). In 2010, the Census Bureau reported that 295,803 people lived in Fayette County, Kentucky. In November, 2012, the city had 28.8 miles of existing bike lanes. This analysis attempts to calculate the number of people in Fayette County living close to bike lanes. 45.8% of Fayette County's population lives within 0.5 miles of a bike lane. 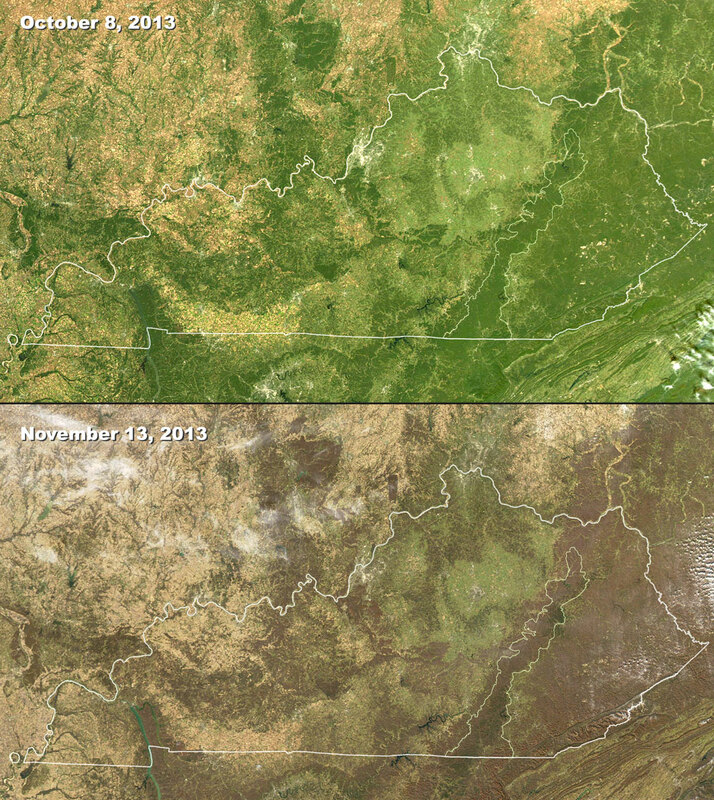 MODIS images, October 8 and November 13, 2013.